That’s where the General Mills connection comes in. Natural and organic food products have been lining grocery store shelves at least since the 1970’s, but in past years relatively little attention was paid to what the “natural” label really means. That has been changing, and the millennial generation in particular has gained a reputation for demanding transparency and accuracy. To compete for attention and loyalty in this market, food companies have to step up their supply chain game to include organic sourcing and sustainable agriculture. All of this leads to the potential for attracting a new generation of young farmers who are looking to put their sustainability ideals and concepts into practice. With that in mind, let’s take a look at some of the recent moves that General Mills has made. 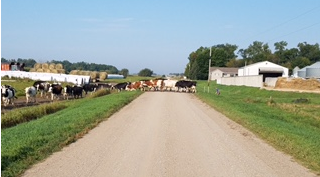 Photo (cropped): Organic dairy farm in Minnesota via General Mills.